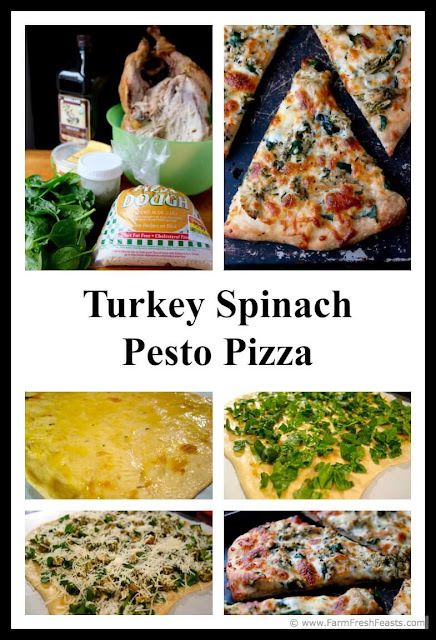 Cubed turkey tossed with pesto then used to top pizza with spinach and cheese. For more recipes using spinach, please see my Spinach Recipes Collection, part of the Visual Recipe Index by Ingredient. Speaking of Visual Recipe Indices, there's also the Visual Pizza Recipe Index. I've got a Greens board on Pinterest where I share likely recipes, follow me there, some behind the scenes stuff on my Instagram feed, and even more recipes and articles on my FB page. Want to know How to Use this Blog? This was my second attempt at the 'make a pizza using leftover turkey' concept. I'm posting it before the first one (which was also quite delicious) primarily because I'm just in a spinach mood. I'd gotten bunches of spinach from the farm share and it was finding its way into everything. Since I keep a stash of pesto in the freezer, it's easy to grab a couple of cubes when I want to add a hit of basil flavor to a meal. This was no exception. I set the pesto cubes in a bowl to thaw and tossed the cubed turkey on top, so it became marinated in the pesto by the time I was ready to top the pizza. Spinach (and other greens such as Swiss chard, kohlrabi greens, broccoli rabe, and kale) give up water as they wilt. (This makes perfect sense since the cell structure of the plant is destroyed with heating, releasing this water.) 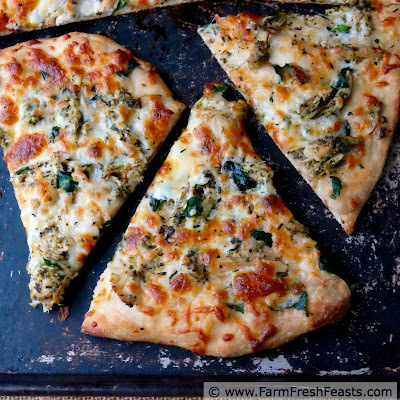 Because of this, I usually precook greens before topping my pizzas. [Good grief, I put a lot of greens on a pizza.] I was feeling wild 'n crazy, though, and just tore the spinach into small pieces this time. Worked great. I had frost-kissed spinach, as the farmers put it. This spinach is thicker/tougher than a tender Spring spinach. Even the tiny leaves are tough. If you've got a bag of baby spinach, skip the 'tear out the rib' step--unless your composting pigs would appreciate it! Preheat oven to 450 degrees Fahrenheit. If your baking stone lives in the oven, like mine, good on you. Smush the garlic into the warmed olive oil and set aside. On an oiled piece of parchment, stretch out your dough into a pleasing shape. Brush the garlic oil evenly across the crust. Scatter spinach leaves across oil. 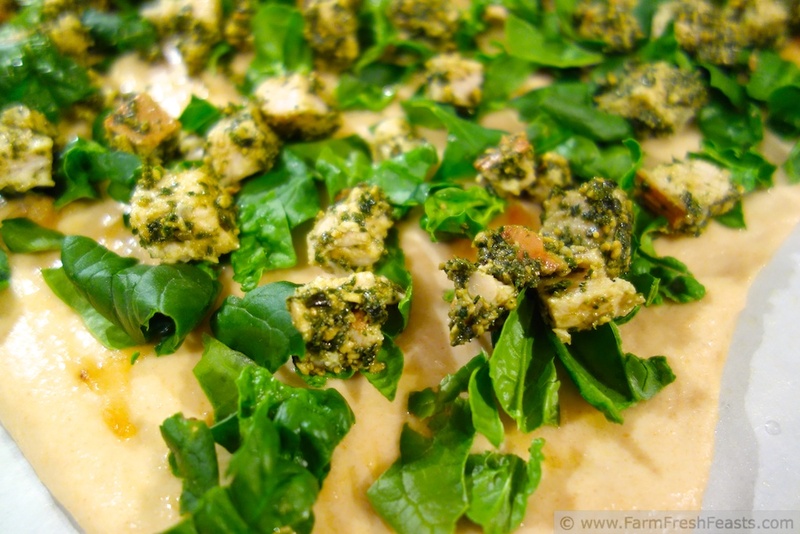 Spread turkey-pesto mixture on top of spinach. Top with cheese and seasoning. Bake, with the parchment on a stone or a cookie sheet, for 5-8 minutes. Shimmy the pizza off the parchment and set the parchment aside. Continue baking for 3-5 minutes until the cheese is bubbly. Cool on a rack, slice, and serve. You could also turn that spinach into pesto and use that on the pizza. I've pinned this one to my Dark Leafy Greens board. 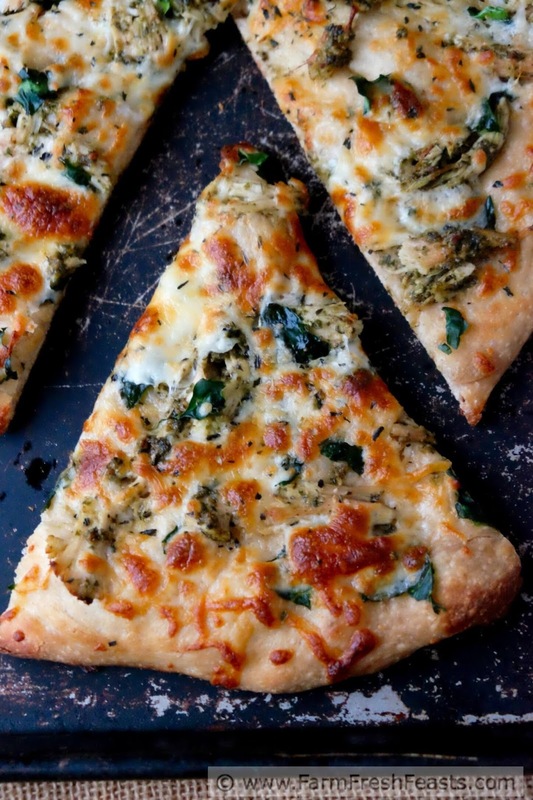 Spinach pesto sounds delicious. I just learned about kale pesto this week. My CSA farm share just offered an extra bag of greens a week and I initially decided against it because it will just be the kids and I during the growing season, but hearing about all the other permutations of pesto have me changing my mind . . .
That looks great, Kirsten! 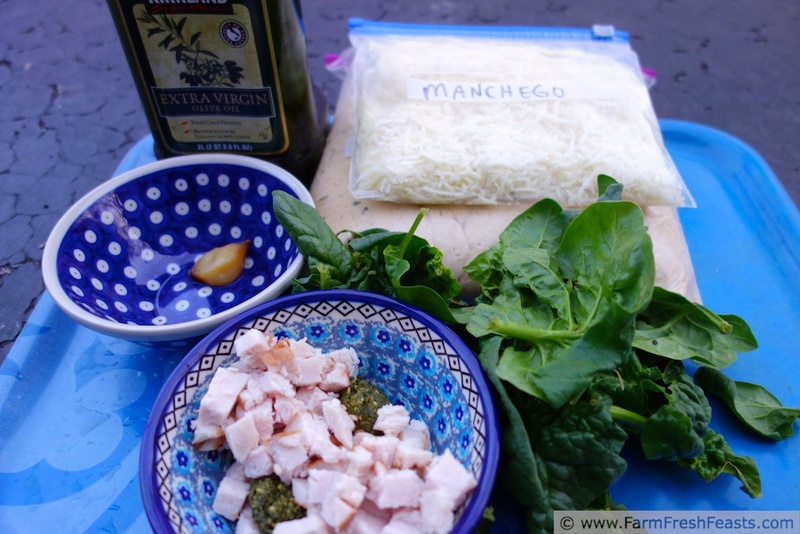 I love the idea of marinating the turkey in the pesto first and the combination with the spinach. I don't know if I've ever had Manchego cheese, but I can't think of a cheese I don't like, so I'll definitely have to try it! I kept hearing Rachael Ray natter on about Manchego, so I when I saw it at Costco I took the plunge--and I've got a ton of it in the fridge now, so I'm glad it goes so great on a pizza. Wow, it's like you're in my kitchen. You blog about far better cheeses than I could ever find! I'm jealous of the yummy-looking grass fed happy cow ones you get at your farmer's market. What a delicious looking pizza, I can't wait to give it a try. It really hits all my favorite pizza notes. I saw this on Facebook and shared it on my page. Looks amazing! New follower here. Thanks! This was a delicious pizza that my spouse keeps asking when I'll be making again. Silly spouse of a food blogger! Thanks! I'm running low on greens and was sort of wondering what else I can put on a pizza--then I started thinking . . . why not fruit? Love the idea of marinating the turkey in pesto! Looks gorgeous and I imagine it taste fabulous. My pesto stash is almost gone. :( Fresh herb season can't come soon enough for me. Going to plant a few spinach and lettuce seeds this weekend, if we can get the garden ready and rabbit-proofed. I've been seeing kale pesto, spinach pesto, and even English pea pesto recipes lately, so I am very ready to get my pesto on. Luckily I've got a bit of pesto that survived--I want to add it to a spring vegetable soup! Good luck with the rabbit proofing--I'm going to try bags of dog hair tied around mine. I hear it works for deer, though my fence so far does a fine job for them. Another winner! 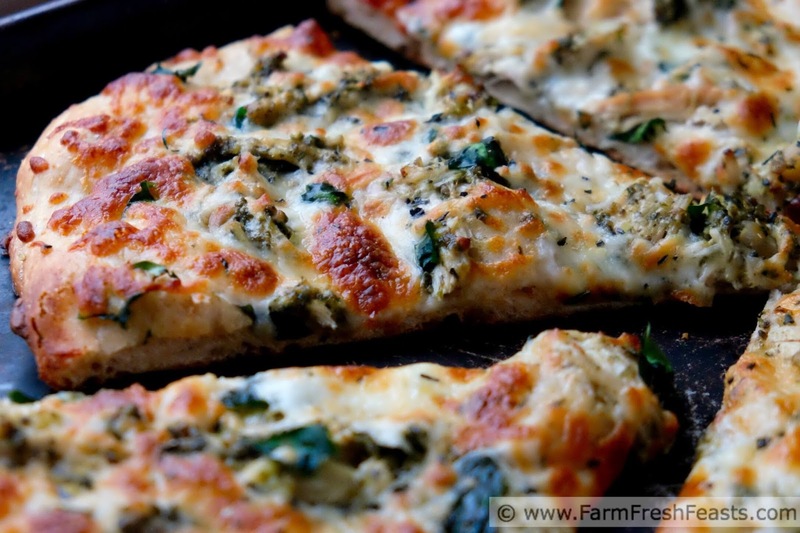 The turkey pesto has me curious...might have to try it out this weekend. I just love pesto, in all forms. I can't wait to try kale and spinach pesto when my farm share starts back up--I just hope I don't run out of put up pesto too soon before the basil season starts up. G'day! What a delicious looking photo, TRUE! I could go for a slice of this now too! Foodie Friend Friday party too!